All of my nesting had been completed for weeks. The baby clothes were washed and put away. The baby diapers were neatly organized by the changing table. Many freezer meals were stocked in the freezer. I had been listening to “Baby Come Out” (Hypnobabies hypnosis track to encourage baby to be born) and done several “Fear Clearings” (Hypnobabies track to release fear) but yet baby was not ready. At 9 p.m. on Thursday, July 19th I put my older two children to bed and then I got a chill. I just couldn’t get warm despite putting on more substantial pajamas, so I went outside in the warm July air. That helped, and the feeling passed, so I got ready for bed while my husband took a shower. My husband wanted to know if he should call the midwives. I said no, which concerned my husband, but my reasoning was that this was my early birthing time and there was no hurry. 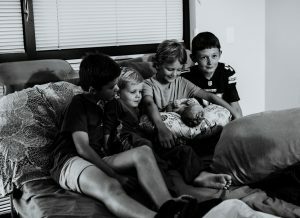 Perhaps it was the sounds I was starting to make, or how fast my previous births have been, but my husband looked sweetly at me and asked me, “What is going on? Why do you not want me to call? Is there something you are not telling me?” I just repeated that I didn’t feel like he needed to call just yet, but if he wanted to call that was fine with me. The next wave came, and it was somewhere about 10:20 p.m. That was when I knew I was entering transformation (Hypnobabies word for transition), and yes, we needed to head to the birth center now! My husband quickly woke up our four children and told them to get into the car that we needed to leave. My waves were coming right on top of each other with little break in between. I just kept my headphones in with my switch in the center (Hypnobabies tool for being in eyes-open hypnosis) and kept directing my bright orange mental hypno-anesthesia down towards my cervix and lower uterus. Luckily there is not much traffic to the birth center in the middle of the night and we only ran one red light. We arrived about 11:10 p.m. and I slowly made my way into the birth center pausing to rock and sway through the waves. My midwife wanted to know if I wanted to be checked upon arrival and I declined. I was in transformation, I knew it and there was no information that could help me with a cervical check. I don’t give birth by numbers! I went into the bathroom because sitting on the toilet was very relaxing to me, but the room is very small, and the midwife encouraged me to come back into the room and try sitting on the birthing chair. 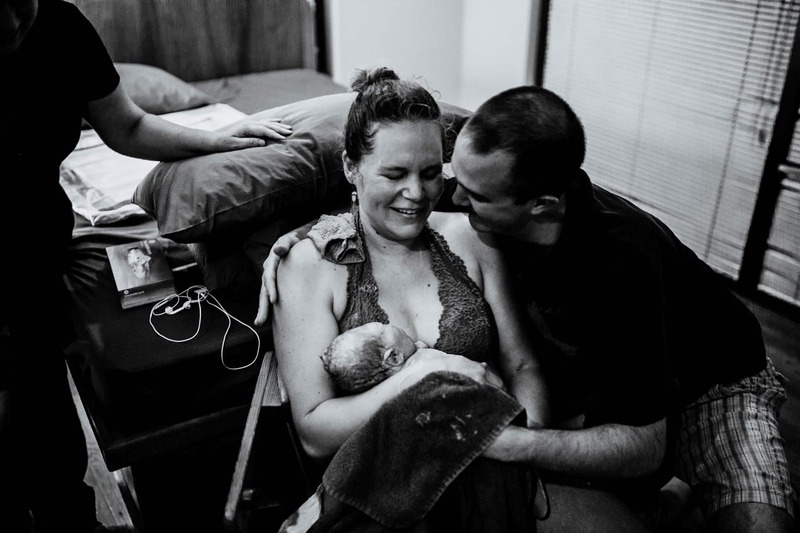 I really didn’t want to move because I was just not getting much of a break between waves, but I did want the support of my husband and doula who could both not fit into the bathroom along with me, so I moved through a wave and made it to the birthing chair. I had previously given birth before in the tub with my other four children, so I had requested the tub to be filled prior to my arrival. I knew that I didn’t want to get into the tub during transformation because I wanted to feel more grounded and I was also incredibly hot during my waves and couldn’t imagine getting into a warm bath. I thought I would move to the tub for the pushing stage. At this point I was still listening to “Easy First Stage” but it was keeping me in my hypnosis and I was enjoying it, so I never changed the track. I had requested that my doula put on “Pushing Baby Out” for the pushing stage whenever that might come because I had never been able to enjoy that for my previous births. I was just sitting on the birthing stool and riding wave after wave. I would get very hot during the waves and would request a cold rag be placed on my forehead at the start of each wave. Apparently, it became somewhat comical to my birthing team as they were running out of ice water to keep the rags cold enough for my liking as the waves were coming back to back. 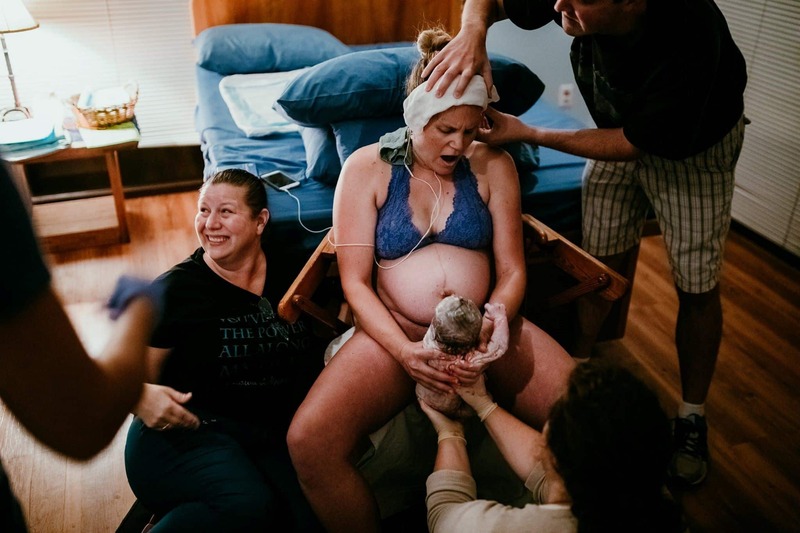 With the wave right before my baby was born I felt a lot of pressure in my low back and asked for my doula to just provide a little counter pressure with her hand. I had her other hand in mine as it was cold from being in the ice water with the rags and it felt good to hold her hand. Even though my eyes were closed during most of transformation I just felt so loved and supported by my birthing team. My doula was reminding me to use my hypnosis cues and telling me how amazing I was. My nurse was helping to keep the ice water as stocked as possible. My midwife was sitting on the floor just watching the birth unfold and telling me that I was doing a great job. My husband never left my side and was holding the cold rags on my forehead. 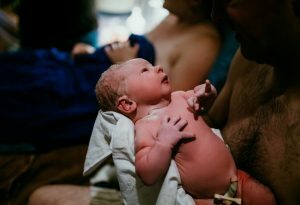 I asked my midwife if she could see the head because I knew the baby would be born within minutes. She replied that she couldn’t see the head but saw the bag of waters. I requested the bag be broken and was surprised when the midwife said she would, but I didn’t feel any trickle or gush and then the next wave started. I just breathed my baby out and it wasn’t until I let go of my doula’s hand that she even realized the baby was being born. It was just so peaceful. 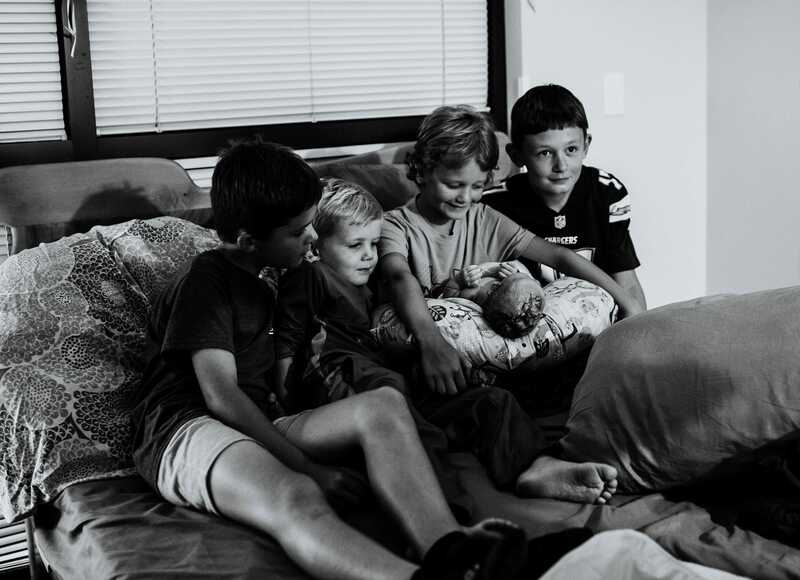 When my husband realized the baby was crowning he asked for our children and family to come into the room, but it was all so fast. Nobody believed me that the baby was that close to being born! I never did get to put on the “Pushing Baby Out” track (Hypnobabies special track just for pushing) but right before I was pushing I was still listening to my hypnosis and it was talking about the time in your birthing time when you will push the baby out, so I found that just perfect timing for my baby’s birth.